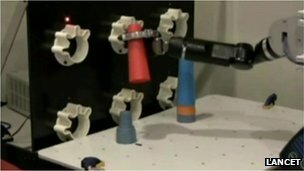 Unrivalled control of a robotic arm has been achieved using a paralysed woman’s thoughts, a US study says. Jan Scheuermann, who is 53 and paralysed from the neck down, was able to deftly grasp and move a variety of objects just like a normal arm. Brain implants were used to control the robotic arm, in the study reported in the Lancet medical journal. Experts in the field said it was an “unprecedented performance” and a “remarkable achievement”. Jan was diagnosed with spinocerebellar degeneration 13 years ago and progressively lost control of her body. She is now unable to move her arms or legs. She was implanted with two sensors – each four millimetres by four millimetres – in the motor cortex of her brain. A hundred tiny needles on each sensor pick up the electrical activity from about 200 individual brain cells. “The way that neurons communicate with each other is by how fast they fire pulses, it’s a little bit akin to listening to a Geiger counter click, and it’s that property that we lock onto,” said Professor Andrew Schwartz from the University of Pittsburgh. The pulses of electricity in the brain are then translated into commands to move the arm, which bends at the elbow, wrist and could grab an object. Jan was able to control the arm after the second day of training and over a period of 14 weeks became increasing skilful. The report said she gained “co-ordination, skill and speed almost similar to that of an able-bodied person” by the end of the study. Prof Schwartz told the BBC that movements this good had not been achieved before. “They’re fluid and they’re way better, I don’t know how to say it any other way, they’re way better than anything that’s been demonstrated before. “I think it really is convincing evidence that this technology is going to be therapeutic for spinal cord injured people. The field of harnessing a healthy brain to overcome a damaged body is advancing rapidly. Earlier this year, Cathy Hutchinson used a robotic arm to serve herself a drink for the first time since her stroke 15 years before. In both studies the results were achieved inside a laboratory so are of little help in the home. 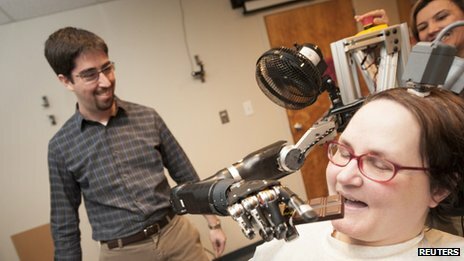 Researchers are now trying to mount the arm on Jan’s wheelchair so she will be able to use it in her everyday life. There are also attempts to give sensation to the prosthetic arms to restore a sense of touch. In a review researchers Gregoire Courtine, Silvesto Micera, Jack DiGiovanna and Jose del Millan described the control of the arm as “highly intuitive and probably responsible for the unprecedented performance of the brain-machine interface”. They added that the system was a “remarkable technological and biomedical achievement” and that such designs were getting closer to a point which “might soon become revolutionary treatment models” for paralysed patients. Movements for animal rights are not irrational denials of human uniqueness; they are a clear-sighted recognition of connection across the discredited breach of nature and culture. Biology and evolutionary theory over the last two centuries have simultaneously produced modern organisms as objects of knowledge and reduced the line between humans and animals to a faint trace re-etched in ideological struggle or professional disputes between life and social science. Within this framework, teaching modern Christian creationism should be fought as a form of child abuse.